Oeil de Perdrix (or ‘eye of the partridge’) is a rosé wine that is a speciality of Neuchâtel. Its origins are in France in the Middle Ages. Vintners tried to deepen the flavour of their white wine in an attempt to compete with the popular Burgundies of the time, so they used red grapes to make their whites. It was only later that the method to colourlessly produce white wine from red grapes was perfected, so this wine still had a pale pink colour from touching the skin of the grapes. The Neuchâteloise version is made from Pinot Noir grapes. The rosy colour remains, and gives it its name, as it is said to be the colour of the eye of a dying partridge. And it was Oeil de Perdrix that led to the most profound and polemic wine revolution in the United States—the rise of White Zinfandel. White Zinfandel is a sweet pink wine that oenophiles love to hate. However, in the late 1980s it became the best-selling wine in America, and its creator was praised for introducing wine to more Americans than ever before. So what does White Zin have to do with Oeil de Perdrix? The winery in Northern California that would eventually produce the White Zinfandel was founded by Swiss immigrants at the end of the 19th century. Later, the owners changed and so did its name—to Sutter Home Winery (probably named for John Sutter, perhaps both the most and least successful Swiss immigrant of all time). After the Second World War the winery was purchased by Italian immigrant brothers from New York, who eventually tried their hand at making an Oeil de Perdrix style wine, using California's favourite red grape, Zinfandel. A couple of years into their experimentation with this style of wine, one of their batches failed due to stuck fermentation (when the yeast dies before it has converted all of the sugars into alcohol), so the wine was put aside. Two weeks later they were pleased to discover that the sweet pink drink tasted delicious. Although they attempted to call it Oeil de Perdrix, the Bureau of Tobacco, Alcohol and Firearms thought the name would be too confusing to the American public, so the vintners just named it after the grape, calling the pink wine White Zinfandel (not confusing at all). Ironically, although the wine snobs thought the White Zin was an over-sweet, pedestrian wine, it was because of its popularity that many old Zinfandel vines were preserved and would later be used to create impressive red Zinfandels in the 1990s. 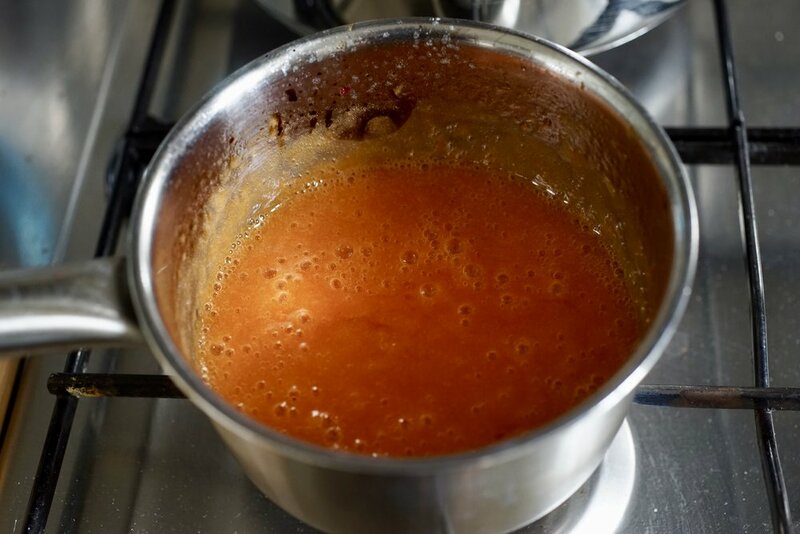 Add the purée to the bottom of a glass, top with chilled Oeil de Perdrix and stir. I made my own stone fruit purée by boiling down a few peaches and nectarines, then buzzing them with an immersion blender. This is a variation on a typical Bellini, which is peach purée and white wine. In general, Oeil de Perdrix is a balanced, dry wine, not sweet, and perfect for light summer foods and creamy sauces.